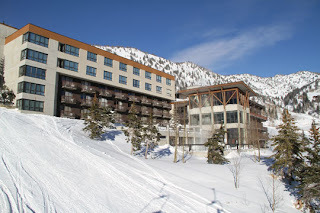 Alta's Rustler Lodge: Check out the new article in Boston.com about Alta and the Rustler Lodge…. Check out the new article in Boston.com about Alta and the Rustler Lodge…. "Speaking of easy, check into The Rustler Lodge at Alta, and you’re basically done planning. This posh mountain lodge has 85 rooms, and treats skiers (sorry, no snowboarders at Alta) to a full breakfast and gourmet dinner, plus après ski hors d’oeuvres, and the best outdoor heated pool into which I have ever plunged. In the morning, we enjoyed a lovely buffet, grabbed our boards and skied down to Alta’s 11 lifts. When our ski legs got wobbly, we skied back, soaked in the steamy pool, then toasted by the fire at Eagle’s Nest Lounge, watching the sun set down the Canyon and looking up at the hair-raising chutes we skied. " The Rustler Lodge is one of the best places to stay when you go on a skiing vacation in that area. The food there is excellent too.